KNOXVILLE, Iowa – official release — Ken Simon photo — Champion drivers Dave Blaney of Ohio, Bobby Davis, Jr., of Tennessee, and Mark Kinser of Indiana, builder Chuck Merrill of Illinois, and media members Dave Argabright of Indiana and William “Windy” McDonald of Arizona took center stage Saturday afternoon as they were officially inducted into the Nat’l Sprint Car Hall of Fame in Knoxville, Iowa. Emcee Dr. Pat Sullivan, and a crowd of 260 guests enjoyed the three-hour ceremony, which honored the exceptional careers of eight inductees. The families of deceased inductees Larry Beckett (grandson Larry Beckett III and granddaughter Lauren Beckett Kelley) and George Nesler (grandson George Nesler III and great-grandson George Nesler IV) were on hand to accept their relatives’ honors. Nat’l Sprint Car Hall of Famers who were present were Tom Bigelow, Jeff Bloom, Allan Brown, Ralph Capitani, Shane Carson, Jerry “Scratch” Daniels, Larry Dickson, Lanny Edwards, Ray Lee Goodwin, Karl Kinser, Casey Luna, Lynn Paxton, Newton “Buzz” Rose, Ron Shaver, Steve Stapp, Bob Trostle, Bobby Ward, Kenny Woodruff and Gordon Woolley. 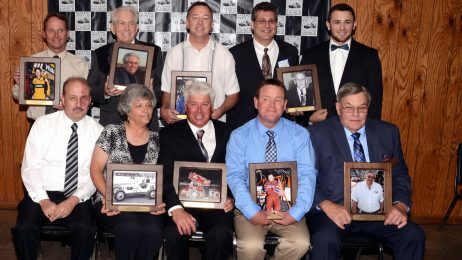 Also in attendance in the Dyer-Hudson Hall on the Marion County Fairgrounds were family members of the following NSCHoF inductees: Lou Blaney (wife Katie Blaney), Bud Carson (son Shane Carson), John Gerber (son Jim Gerber) and Elbert “Babe” Stapp (son Steve Stapp). The program was dedicated to the memory of recently deceased Nat’l Sprint Car Hall of Fame inductees Rollie Beale, Gary Bettenhausen, Anthony “Andy” Granatelli, Harold Leep, D. William “Speedy Bill” Smith, A.J. Watson and Kramer Williamson, and deceased National Induction Committee members Marty Little and Dennis Wood. Nat’l Sprint Car Hall of Fame & Museum Foundation board president Jeff Savage presented the 2014 President’s Award to museum volunteer and past museum board president Andy Clark of nearby Oskaloosa, Iowa. This year’s twenty-fifth NSCHoF induction banquet again featured dual large-screen televisions showing photos organized by videographer Kris Krohn. In a surprise announcement prior to the dinner, museum executive director Bob Baker and board president Jeff Savage revealed that the North American Sprint Car Poll’s “Outstanding Contribution to the Sport Award” will now be permanently named in honor of poll founder, former museum executive director and current curator Thomas J. Schmeh in recognition of his twenty-five years with the museum foundation.